The Irish Times "Máire Ní Chathasaigh and Chris Newman produce music of fire and brilliance on harp and guitar. This latest release from the high-wire act in traditional music is live and without a net. The wow factor is, as usual, very high; what a pity domestic CDs can't be slowed down like tape and vinyl, the better to appreciate the dexterity. Although some of the pieces included have been recorded before they have been metamorphosed into something different in the meantime, and in some cases are almost unrecognisable. Genteel Eleanor Plunkett is rushed headlong from the 18th to the 20th century by a raunchy guitar solo, while A Sore Point has become a bravura showy slalom piece where harp and guitar chase each other up and down the octaves. Táimse Im Chodladh is perfection; spare, resonating and beautiful." Folk Roots "Wandering around the Scottish Highlands and Islands last summer with no particular itinerary, I discovered that on both Mull and Skye I had contrived to miss concerts by Ní Chathasaigh & Newman by one night. Judging by this stunning album (recorded at several island venues and the Harp Festival at Balnain House in Inverness), I really should plan my holidays better. Máire Ní Chathasaigh is not only a virtuoso harp player but a tremendous singer as well. Chris Newman is one of the best flat picking guitarists in the UK, with a remarkable sympathy and feel for traditional music. Together they achieve a rare synergy, which shines through whether they're playing an O'Carolan slow air with a beautiful improvised guitar solo (Eleanor Plunkett), bouncing around a traditional American fiddle tune (Turkey in the Straw), or alternating the lead at breakneck speed on a mock ragtime tune (Stroll On). Máire's singing on the ritual Thugamar Féin an Samhradh Linn definitely scores highly on the 'small hairs' scale, contrasting well with the lighthearted A Shaighdiúirín a Chroí. This duo clearly have a great time but also take their music and their sound very seriously, and Newman's expertise at recording acoustic music has produced one of the best live albums I've heard in a long time. 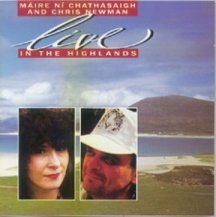 Máire and Chris are always a treat to see in concert and this album captures the essence of these two remarkable performers in a rare and priceless way. Absolutely essential." Dirty Linen "Anyone who has seen Máire Ní Chathasaigh and Chris Newman live in concert knows that they are one of the most accomplished duos on the circuit today. 'Graceful nonchalance' is a good description of their confident and polished sound executed so painlessly. Blazing guitar and dancing harp move effortlessly from flashy American fiddle tunes to Irish reels to swing/jazz frenzies . Sometimes one can forget the blithe grace of Ní Chathasaigh's voice in the heat of the instrumental fervour." Rock 'n' Reel "Two sets of strings in perfect harmony: simply astonishing! Both are technically brilliant players and it's to their credit that they can combine this virtuosity with an almost tangible feeling of warmth and spontaneity. As live albums go, this is definitely one of the better ones because although several of these tunes have appeared on earlier recordings their new arrangements and the sizeable chunk of previously unrecorded material lifts Live In The Highlands above the usual 'let's release a live version of the last album and fleece the fans' mentality of many artists and record companies. Excellent!" Folk On Tap "The record output of this outstanding couple continues unabated, and with it the grandeur of their playing. Practically everything that is to be said about their playing has now been said. The wonder is that they can still produce music that is capable of surprising us and which sounds as fresh as though they had just discovered it. So when I say that the listener who has already heard Máire and Chris will know what to expect in terms of skill, finesse, sheer technical brilliance, and quality of repertoire, that same listener will still be caught as unawares as if he or she is just discovering Máire and Chris for the first time."